We had a nice run higher over the past several years. The economy saw some nice slow and steady growth. But the party is over. In a bear market, stock prices drop at least 20%. But fundamentals tell us to expect a drop of at least twice that much. I believe we’re on our way to a 40% decline in the stock market. That price target is based partly on how the economy works. But the explanation can be a little technical. Economists agree there’s a cycle of growth and contraction, or boom and bust. This cycle existed in ancient times when weather patterns led to good times and bad. It continued in the industrial economy as expansions led to excesses and recessions followed to correct the excesses. As an example, think of railroads in the 1800s. It was obvious that railroads between New York and Chicago could make money. So, industrialists built the railroads. This resulted in jobs and growth. Seeing the chance for profits, other would-be tycoons began building even more railroads. Soon, there were too many railroads. Companies started losing money. That led to the loss of jobs and recessions. That exact same dynamic continues to play out in the economy. When the internet was new, book stores began selling online. Soon, Amazon joined the fray. At first, it was one of hundreds of online booksellers. For a time, some websites made money and created jobs for computer programmers. But that didn’t last. Amazon became more and more efficient. Its low prices forced smaller competitors out of business. It moved beyond books and soon created a bust in the industry. That dynamic of boom and bust allows us to find price targets in the stock market. In the boom, companies enjoy large profits. In busts, profits contract. We can measure these changes with the net income margin. Income margins show a property called “mean reversion.” This means they fluctuate above and below their average, or mean. 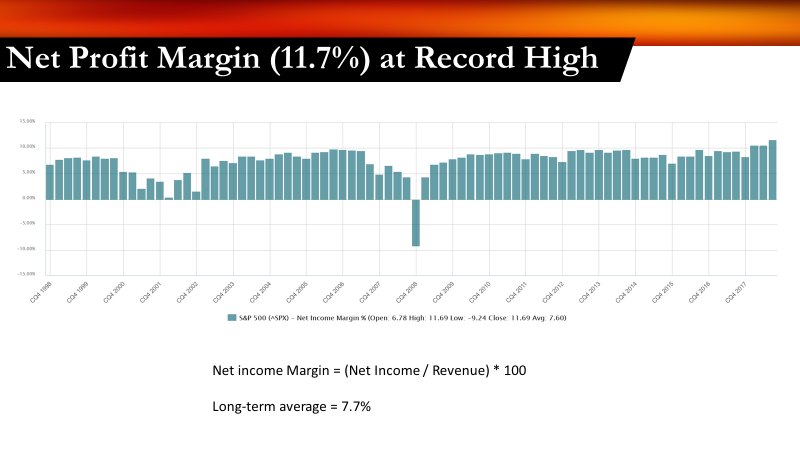 Right now, after a long economic boom, income margins are above average. They are at a record high. Mean reversion tells us to expect them to fall back below average. The chart below shows the net income margin for the companies in the S&P 500. It tells us the average company is making $11.70 in profits on $100 of sales. That’s well above the average of $7.70 in profits for $100 in sales. As income margins drop in the next few quarters, watch for stock prices to follow. To find a price target, we can start by looking at revenue. In a recession, expect revenue to contract for the companies in the S&P 500. In the last recession, revenue declined by 15%. Revenues dropped 9% in the recession that began in 2000. To be conservative, we will estimate a 10% decline in revenue. To find earnings, we then multiply the income margin by the expected revenue. Again, to be conservative, estimate an income margin of 8.9%. That’s the average margin for the past 10 years. That all provides an estimate of earnings per share in the S&P 500 of $103. This is a 20.7% decline from the earnings of $129.89 for the past 12 months. The next step is deciding on the right price-to-earnings (P/E) ratio for the earnings. Over the long term, the average P/E ratio is about 17. Using that as a target, the fair value of the S&P 500 is about 1,751. That’s about 40% below the all-time high. That means this is an averaged-sized bear market. Since 1950, the average bear market associated with a recession declined 37%. Technical analysis confirms the price target. If the S&P 500 drops below 1,800, it will give back half of the gains achieved in the bull market. Moves like that are normal. So, fundamental analysis, history and technical analysis tell us to expect a 40% decline in the S&P 500. Of course, the decline could be even worse than that. Now is an ideal time to prepare for that decline. Have a plan to protect your capital. Or, be prepared to lose a significant amount of capital.